Opening with the Gospel-tinged ‘Else The Devil Try’ and then dragging the choir into the far more country rocky ‘The Man Who Ate The Hurricane’ sets Williams’s stall out as a purveyor of the gothic country as demonstrated by the likes of Viarosa and some of Willard Grant (without the apocalyptic vocals). There’s lots of fire and fury with Williams couching his vocals atop a swinging guitar and piano refrain. ‘Oil and Water’ is similar in the way that a motif is created before the echoey vocals dive in, followed by the wailing backing vocals and feedback dripping guitar. This is moody stuff! ‘Magpie’ might be a misstep as it puts Williams’s vocals front and centre on opening and if the opening tracks of this album have a weak link it is the vocals – not quite distinctive or arresting enough for the strong material perhaps. Then the album changes radically. The next four tracks could be from a different and dare I say better album. 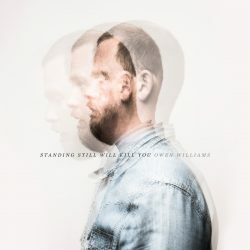 A real highlight is the America like ‘Living Life Inside A Hole’ wherein Williams forgets the demons and delivers a beautiful and sunny song that doesn’t sit with the rest of the material but lifts the whole album. It’s a perfect marriage of songwriting and performance, and probably the best single song this reviewer has heard this year in its joyous simplicity and structure. Perhaps it’s just the acoustic guitar as ‘Jericho’ follows the previous high in similarly successful way. There is some brilliant stuff here: Williams just needs to decide which way he wants to go.